This cutie may play the darling, but watch out: it knows "bun fu." Back away and pick these fluffy pests off from a distance. This cutie may play the darling, but watch out: it knows "bun fu." Bruiser Likes to engage in bare-knuckled fights. Spinner Repeats a pattern of hopping around and then resting. Space Invader Dashes in with its Me Me Cross then hits with a combo. Hopper Bounces around doing attacks that hit multiple targets. 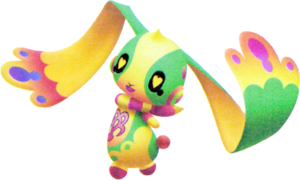 The Me Me Bunny is a Dream Eater that appears in Kingdom Hearts 3D: Dream Drop Distance. 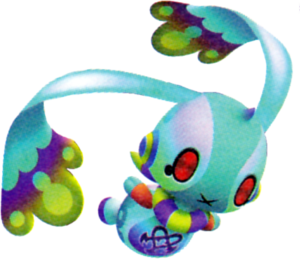 The Me Me Bunny's general design is similar to the Unversed Hareraiser and the Heartless Tornado Step, albeit with a rounder body, arms, and legs. 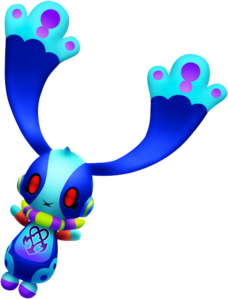 As a Dream Eater, the Me Me Bunny has long ears with something similar to a "paw" at the ends. It has a small spike on its head, a half-circle on its cheeks, and a collar. The Dream Eater's name combines the Japanese word for "ear" (耳, mimi?) and "bunny". The Spirit Me Me Bunny is primarily colored in yellow and green. The dots on its ears, stripes on the collar and its lower legs are colored purple. The collar's primary color and lines on its cheeks are yellow. It has yellow heart shaped eye in the black eye space. The Spirit Dream Eater symbol is located on its chest. The Nightmare version of the Me Me Bunny is primarily colored in dark blue and turquoise. The dots on its ears, stripes on the collar and its lower legs are colored light purple and the collar's primary color and lines on its cheeks are green. The Dream Eater has red eyes and red-to-orange transition of color on its arms. The Dream Eater symbol is located in its chest. When confronted by Sora and Musketeer Mickey after his plans are revealed by Musketeer Donald, Pete summons several Nightmare Me Me Bunnies to fight them. However, when Mickey jumps up to arrest Pete, but gets punched, one of the Me Me Bunnies attacks Sora from behind while distracted, knocking him out. ↑ 1.0 1.1 Becomes available when in Bruiser disposition. ↑ 2.0 2.1 Becomes available when in Space Invader disposition. The Me Me Bunny Recipe can be purchased from the Moogle Shop for 100 munny once Country of the Musketeers has been entered. The Me Me Bunny can be created through six different recipes. The third recipe is a rank D recipe. The fifth recipe is a rank A recipe that has a 70% chance of success. This page was last edited on 3 April 2019, at 18:06.